Your browser doesn't support the features required by this site, so you are presented with a simplified version. For the best experience please use the latest Chrome, Safari or Firefox desktop browser. headlamp, feed dog tied to post. painting of a lighthouse scene? to return safe slash sound. decisions have been left out. Love the lesson longest learned, no homily. Country flat as the eye can see, Postage stamp Poland, Holland. Eggshell thin, it will glisten lethally looked at one way, becoming like dove feathers the other. The sort of footlocker-packed gardening stashes away. the letters I always reach when at the rim, the ruinous bring of love. Grazing the eye, glassing the eye that hustler faster. Who made no lady of me. Winter's pained face glistens thru black branches where water ends. Don't put me out. I am not a fire. but not like Belsen's blue numbers. A slightly modified embroidery table is what my love presents. Stretches Far, but I have walked to the end of the night & found you. smoking, collar turned up, an airport somewhere maybe Yugoslvia. with child, just in time. Go to the Tower of London. Neck wound in a long reefer. like all the people out of conrol forgetting speech. No more dark. No more light. she will star in this one. bees swarm out of comb. The next world will be dustless, surreal, almost neon. Like a painter laying the first color on his canvas. Purple People, Radiation people come and visit me. I shall sit in the Garden for the Blind above the sea. Totally upped the romantic ante. The perfectly chillzone your moment of Zen. But we have no mother. The arm of he blues shortens. Turn the radio down. Light up. Delicious. Relax the shoulders, shrug, turn the jacket collar up. knees to child, foldng & unfolding them like a stork. All my pennies go on books, ring of bright thunder. Will anyone read them when I am dead & gone? I walk across an airport, slicked with rain, legs moving easily as scissor s making time. Hip joints real ball & socket. Cutting darkness, a flash of purple on fingernails. Smoking, my cigarette a little ikon like the cross this me in Majorca, Spain. all thoset tins of tunafish. Got cigarettes, Black Russians. Forgot matches. Alma didn't cut cheese with me. But afer all we aren't children playing on the school playground. I used to sing you a tune, or whistle an aria from Handel. You piled my books onin a sack slung from the wheelchair handles. We two who used to just get up there & boget. Whatever we remember let's not forget the other. Love is a continuing lesson. Release, ride me terrier: Little Moll (that flash of prostitute) knows that love begins alone in the gloom. These sombre contain bottles are two horses, Nicola & Nicolo I ride while bells of Cordoba ring. Where? A dawn I have never seen. Digging my ankles into you spur, ivory satin, known to me like the thrill of coming. Listen there are unicorns coming along the side streets. We learn things by touching ourselves & each other we never can learn from teachers. Black keys white keys come to me. Don't let bad things happen to the children. The broken man has come. I do not offer him honey: Amiel. I cap it. I save it for the children. Mother wanted me to see France and London. Sister said "Rough it." From mascara to violin varnish. White Yule promised mercury dips. An adolescent, my extreme incarceration led to extreme joy. From pillar box to stained glass. Foxy writes me that all through his pelvis he is cancer. The blood is stained glass window red. Near Shadwell Basin in Boneville. Such curious things are gong on: stamps pasted in color window. Setting up a lab on the top floor of an East London home. What goes on up so high next to sky. Blend another color with madder. The Fury of the Mauve Era. O to have a beautiful backbone. In Beirut my ultimate aim was to find purple	but my immediate aim was to find coffee. Make things whole again. With maximum tenderness, mercy. Lace could not get more whorled with circles. Than in my dreams of holding (under a storm cloud, just enough darkness for pity the blinding light). A doorknob is caught in a woman's pelvis (Frida Kahlo). I see a cart filled with Indigo, drawn by a mule, looks like blue hay. Mule like tilted, a Gargoyle face, Quasimodo. Have seen the place where light begins to dance. Where shall I go in the gloom alone, the gloam, work's apron. A square of brown or dove Quaker grey over my lap. I set my hands in my lap. He waits till he no longer lasts. Riding beside in a carriage of color. I go thru a mystical process down Iron Age Hill from the village. To create from woad the color Indigo. She is a gem, a keeper. she takes my torn things away bring hem back like new. clenching a deal, holding strong, saving a child. Dying their pale ancient torsos blue fit the ancient Britons. Lo to bring things to artists supply shops in London. December slides it translucent coat over park benches, the boat basic at Riverside & 72nd where we did most of our early days courting: What did I know, a girl who was an alumna of the State Hospital, still virgin at twenty one, attending a girl's college formerly "Female Normal School," hadn't tasted gin. A straight A student with eyes for the Classics professor, another woman with Italian boy bob. Got high on my first coke & aspirin. Winter slips clear of its skin translucent affections and hostilities stand. Spearheaded: exposed like lace of the six-sided poliovirus under the high magnificaion glass: Hold this old yellow speller in your hands: smell the history behind it: offered my ring, a poor enamel open band wwe bought in the Greeenwich Village. I bought my wedding dress at Carnaby Streets where the daughters of the Mexican governors got their bridal dresses. Stretched out on beds then all fuschia, chartreuse, Indigo. The terrible beehive hairdos of he fifies. If a man could fall for a girl then, but I wore classic Smith girl attire: pullover & mother's pearls, sholder length pageboy, Sylva Plath swoop but I was tender as an angel no worldly broad. Androgynous-thin. My boyish tree-climbing had been exchanged for the quick grab in hospital halls, wheelchair races. When that passion, music, became driver again I got a drawing board with black wrought iron wheel & composed first thru fifth species co unterpoint. One whole year we wrote motets. A medieval choral school. Passion fruit & poemgranate. The embroidery table tilted overlooking Sant Annes & Riverside. Embroidery of scalloped bushes straight out of Alice in Wonderland, but I'd taken my first smoke in the back bathroom I was a fallen woman. I never took a man for husband. We scripted cancellations to the wedding, explaned to the harpist we'd engaged for the chape at The Coisters for that afternoon. I wound my wools in a basket, lidded it. Sold the drawing board giving the wheel a last spin to the lowest position. December once again slid its too thin coat over the bones of the city, the human bones began moving in new ways. Mother said that fat Lesbian Gwyn had seduced me: she played the cello, I composed: we gave Unitarian Fellowship Sunday morning services & played the black ghetto of Oakland: She rented a cottage out of Lady Chatterly's lover, a poemgranate tree drawn on the kitchen walls: We hung our windbreakers on a thin nail. We always had to move the car for a neighbor to get to work. Frisco, the mystical city that had broken more than a few poets' hearts. Despite December & no money, she found second-hand booties with fleece-lining. She bought a cheese wheel in the Portuguese section of town, put it on the elevator & sent it up to my floor: I was already in full bloom. You ask about my husband. I never took one. Several took me. And put me down like a book they'd grown bored reading, print side down in the grass. So I moved to a new town. A woman in another country read my poems in a book & fell in love. To cut to the chase, we have lived together since then: short & tall, blond & dark. We crisscrossed the continent exchanged countries. But there's one voyage with more lists than Homer: Disability, two religions, family feuds, reconditioning: This is the dry voyage, despite drowning, that begins like the alphabet wth A for Ativan. I was in my thirties. Now, seventy-two, oxymorphine contin cannot ravage what is already mown beyond burn or blame. I thought the gin years the worst during immigration. But this was ldower yet: an interesting thing you learn about pits: they always have deeper ones: I knew that we'd never have to take this trip again. Crossing from Hades to the promised land: And we haven't. That morning in the medical pavilion I learned all I'd ever have to know of Dante's inferno. Out of withdrawal, the backpack cutting into our ribs like anvils. We came home. Thin ribbed, voiceless. I'd spare you the details but I give you what you ask in the man: You asked about my husband. Our amaryllis looks on LSD. I cannot bear the feeling of being old. Hold. Hold me. Pearly table cloths in space. More when my cheeks' flush dies doem from Morphine. More when I have sacked together like toys my beautiful wives & husbands. Browh cloth. Dark wood. Homecoming. so they passed the long warm lazy days on the Downs. The very paths used by Chaucer's pilgrims. She licked her moonlit fur. Endymion's gloss and saliva create an atmosphere like the aftermath of fratricide. A rutabaga casts a shadow on a gray tile; ants swarm its burly bumps. From the upper-left corner of the frame queer light angles to so centrally in the center the way-fab location ends up arresting. The center of what: shadow or casts? Endymion's gloss and saliva--who knew that overlap could outdo Renaissance chiaroscuro. Right outside the frame a rutabaga rots; the smell magnifies her eyes till they look daemonic and this particular demon is oh so pretty not the kind that makes your dreaming heart freak till eyes fright open and a grumpy rump gets up. Someone has cut rutabaga into stars. Stars don't make movies so why are there movie stars. Stars are dead; movie stars are not--even the dead ones. The one thing stars have in common with stars is being simultaneously close and far. The knife the ones scattered on these porch-steps were cut by shines like a downs of dewy humus. Rutabaga is a good name for a cozy feline--one can then call it Vega because the switch is more fun than some lock-jawed B. The litter-box needs changing but no-one gets up from their screen if anyone's even home. The movie-stars in the bedroom cannot be seen but where they're affixed to the walls quadrants subtly sensuously glitter. An artist painted a picture; she split her canvas between two scenes: a cartoon tiger drinking a mug of cut-‘n-paste coffee and a tiger in a row of the beans lining a lowly ridge as lovely as its muscles as they pulse through its hide. She pines for dream-on shots; while waiting she wonders why British English for rutabaga is Swede. Stars light a farm in Sweden. Students with handsome carriages carry fruit across a stripe of grass. Fifty kilometers away a white Siberian named Handsome is in the midst of catching a cold but that's hard to freak for when sun turns sere fields gold. Domestic purrs and then a letter in the alphabet's been purloined. Dazzling dead energy. She licks her fur; dust falls and she does the cleaning over. He's a fan of threes: square them and there's nine or the number forming the Ennead. I concur: Egyptian mythology possesses a freshness the Greek lacks. Leave a bone out long enough and in the process of revitalizing you'll need to conjure up some marrow. She loved her cat but didn't offer any of her parmesan-and prosciutto-rind fortified red-wine poached marrow to then be put on toasts and drizzled with the poaching liquid reduced to a syrup. She shudder-laughed at how painful breaking out one's frame would be--lapse one can't recover from. She decided to look at lapses based on unusual ratios. I advocate lapses be redefined as lapis; I get in the way like Apophis. If I were an artist I'd like to make a piece which pleases a cat by which I mean a cat appears pleased to me. A bloody mouse is almost always an unpleasant interruption so it's a shame that's just what's scampered across the linoleum though the blood track is pretty--tres De Kooning. A gown to be grown out of? I switch on the kitchen light. Am I what I think I am. A list of finite thoughts. to where the ashes end. The lift, the wind-up of you. 1. The night before, b hit a deer on the way home and left an imprint of a torso. 2. b said to a, "I will do it later" and took sugar in his coffee. If a slipped on the ice and broke her leg so that the bone kicked out, that implies that b did not shovel and used sugar instead of salt. Considering the givens, yes, there is proof to blame b. However, as a certainly did not scream (neither did the deer) and thus alert b of her fall, it is not b’s fault for not noticing and worsening the condition with time. 1Indeed, apology will not shovel ice. 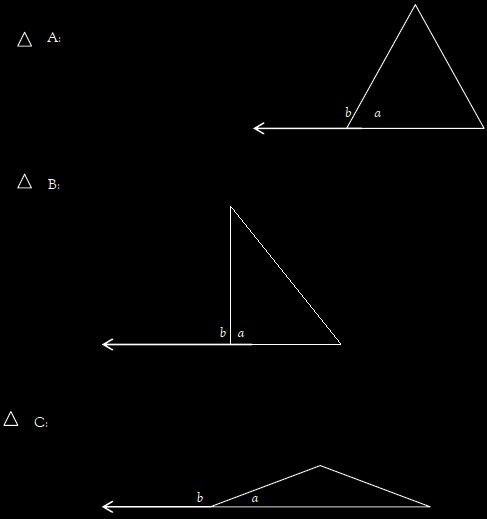 Let a live in triangle A and b live in the angle outside of triangle A. For years, a has been trying to get b to lean backwards, to let her breathe for one second (a says, "it feels like bricks in my throat"). 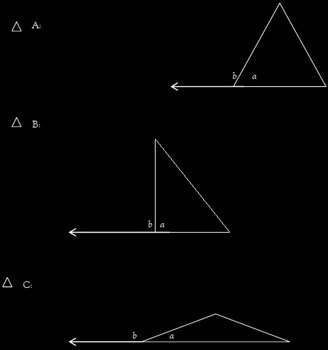 For years, a has dreamt of triangle B, where they are both upright, and can place their hands equally against the glass. But b is suspicious; b says, "if I lean backwards, how am I to know you won’t push me down?" b says he can feel the tension between their angles and refuses to take the chance. "I am not stupid," b says, pushing forward into what is now triangle C. Crying, a thinks of collapsing, but holds up her angle, if only to feel something on the other side.